Obverse: IMP CAES DOMIT AVG GERM PM TR P VII, laureate head left. Reverse: IMP XIIII COS XIII CENS P PP, Minerva standing left, holding spear. Domitian (Latin: Titus Flavius Caesar Domitianus Augustus; 24 October 51 – 18 September 96) was the Emperor of Rome from 81 to 96. He was the younger brother of Titus and son of Vespasian, his two predecessors on the throne, and the last member of the Flavian dynasty. During his reign, his authoritarian rule put him at sharp odds with the senate, whose powers he drastically curtailed. After the death of his brother, Domitian was declared emperor by the Praetorian Guard. His 15-year reign was the longest since that of Tiberius. As emperor, Domitian strengthened the economy by revaluing the Roman coinage, expanded the border defenses of the empire, and initiated a massive building program to restore the damaged city of Rome. Significant wars were fought in Britain, where his general Agricola attempted to conquer Caledonia (Scotland), and in Dacia, where Domitian was unable to procure a decisive victory against king Decebalus. Domitian's government exhibited totalitarian characteristics; he saw himself as the new Augustus, an enlightened despot destined to guide the Roman Empire into a new era of brilliance. Religious, military, and cultural propaganda fostered a cult of personality, and by nominating himself perpetual censor, he sought to control public and private morals. As a consequence, Domitian was popular with the people and army, but considered a tyrant by members of the Roman Senate. Domitian's reign came to an end in 96 when he was assassinated by court officials. He was succeeded the same day by his advisor Nerva. After his death, Domitian's memory was condemned to oblivion by the Roman Senate, while senatorial authors such as Tacitus, Pliny the Younger, and Suetonius propagated the view of Domitian as a cruel and paranoid tyrant. Modern revisionists instead, have characterized Domitian as a ruthless, but efficient autocrat whose cultural, economic and political program provided the foundation of the peaceful second century. Domitian was born in Rome on 24 October 51, the youngest son of Titus Flavius Vespasianus — commonly known as Vespasian — and Flavia Domitilla Major. 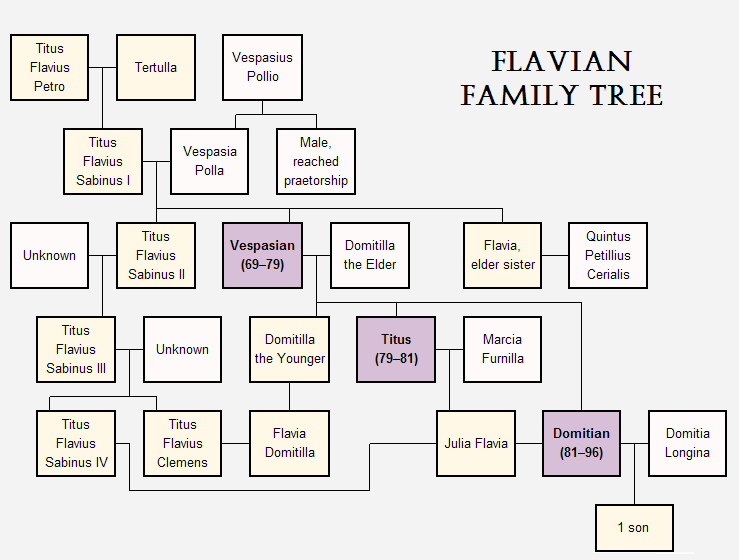 He had an older sister, Domitilla the Younger, and brother, also named Titus Flavius Vespasianus. Nevertheless, Petro managed to improve his status by marrying the extremely wealthy Tertulla, whose fortune guaranteed the upwards mobility of Petro's son Titus Flavius Sabinus I, Domitian's grandfather. Sabinus himself amassed further wealth and possible equestrian status through his services as tax collector in Asia and banker in Helvetia (modern Switzerland). By marrying Vespasia Polla he allied the Flavian family to the more prestigious gens Vespasia, ensuring the elevation of his sons Titus Flavius Sabinus II and Vespasian to senatorial rank. The political career of Vespasian included the offices of quaestor, aedile, and praetor, and culminated with a consulship in 51, the year of Domitian's birth. As a military commander, Vespasian gained early renown by participating in the Roman invasion of Britain in 43. Nevertheless, ancient sources allege poverty for the Flavian family at the time of Domitian's upbringing, even claiming Vespasian had fallen into disrepute under the emperors Caligula (37–41) and Nero (54–68). Modern history has refuted these claims, suggesting these stories later circulated under Flavian rule as part of a propaganda campaign to diminish success under the less reputable Emperors of the Julio-Claudian dynasty and to maximize achievements under Emperor Claudius (41–54) and his son Britannicus. By all appearances, the Flavians enjoyed high imperial favour throughout the 40s and 60s. While Titus received a court education in the company of Britannicus, Vespasian pursued a successful political and military career. Following a prolonged period of retirement during the 50s, he returned to public office under Nero, serving as proconsul of the Africa province in 63, and accompanying the emperor during an official tour of Greece in 66. The same year the Jews of the Judaea province revolted against the Roman Empire in what is now known as the First Jewish-Roman War. Vespasian was assigned to lead the Roman army against the insurgents, with Titus — who had completed his military education by this time — in charge of a legion. Of the three Flavian emperors, Domitian would rule the longest, despite the fact that his youth and early career were largely spent in the shadow of his older brother. Titus had gained military renown during the First Jewish–Roman War. After their father Vespasian became emperor in 69 following the civil war known as the Year of the Four Emperors, Titus held a great many offices, while, Domitian received honours, but no responsibilities. By the time he was 6 years old, Domitian's mother and sister had long since died, while his father and brother were continuously active in the Roman military, commanding armies in Germania and Judaea. For Domitian, this meant that a significant part of his adolescence was spent in the absence of his near relatives. During the Jewish-Roman wars, he was likely taken under the care of his uncle Titus Flavius Sabinus II, at the time serving as city prefect of Rome; or possibly even Marcus Cocceius Nerva, a loyal friend of the Flavians and the future successor to Domitian. Unlike his brother Titus, Domitian was not educated at court. Whether he received formal military training is not recorded, but according to Suetonius, he displayed considerable marksmanship with the bow and arrow. A detailed description of Domitian's appearance and character is provided by Suetonius, who devotes a substantial part of his biography to his personality: "He was tall of stature, with a modest expression and a high colour. His eyes were large, but his sight was somewhat dim. He was handsome and graceful too, especially when a young man, and indeed in his whole body with the exception of his feet, the toes of which were somewhat cramped. In later life he had the further disfigurement of baldness, a protruding belly, and spindling legs, though the latter had become thin from a long illness." In Rome, Domitian was placed under house arrest by Vitellius, as a safeguard against Flavian aggression. Support for the old emperor waned as more legions around the empire pledged their allegiance to Vespasian. On 24 October 69, the forces of Vitellius and Vespasian met at the Second Battle of Bedriacum, which ended in a crushing defeat for the armies of Vitellius. The ancient historian Tacitus describes Domitian's first speech in the Senate as brief and measured, at the same time noting his ability to elude awkward questions. Domitian's authority was merely nominal, however, foreshadowing what was to be his role for at least ten more years. By all accounts, Mucianus held the real power in Vespasian's absence and he was careful to ensure that Domitian, still only eighteen years old, did not overstep the boundaries of his function. Strict control was also maintained over the young Caesar's entourage, promoting away Flavian generals such as Arrius Varus and Antonius Primus and replacing them by more reliable men such as Arrecinus Clemens. Prior to becoming Emperor, Domitian's role in the Flavian government was largely ceremonial. In June 71, Titus returned triumphant from the war in Judaea. Ultimately, the rebellion had claimed the lives of over 1 million people, a majority of whom were Jewish. The city and temple of Jerusalem were completely destroyed, its most valuable treasures carried off by the Roman army, and nearly 100,000 people were captured and enslaved. Because Titus effectively acted as co-emperor with his father, no abrupt change in Flavian policy occurred when Vespasian died on 23 June 79. Titus assured Domitian that full partnership in the government would soon be his, but neither tribunician power nor imperium of any kind was conferred upon him during Titus' brief reign. The new Emperor was not eager to alter this arrangement: he was under forty and at the height of his power. Whatever the nature of their relationship, Domitian seems to have displayed little sympathy when his brother lay dying, instead making for the Praetorian camp where he was proclaimed emperor. The following day, 14 September, the Senate confirmed Domitian's powers, granting tribunician power, the office of Pontifex Maximus, and the titles of Augustus, and Pater Patriae. Although he made no pretence regarding the significance of the Senate under his absolute rule, those senators he deemed unworthy were expelled from the Senate, and in the distribution of public offices he rarely favoured family members; a policy that stood in contrast to the nepotism practiced by Vespasian and Titus. Above all, however, Domitian valued loyalty and malleability in those he assigned to strategic posts, qualities he found more often in men of the equestrian order than in members of the Senate or his own family, whom he regarded with suspicion, and promptly removed from office if they disagreed with imperial policy. Upon his accession, Domitian revalued the Roman currency by increasing the silver content of the denarius by 12%. This coin commemorates the deification of Domitian's son. Jones estimates Domitian's annual income at more than 1.2 billion sestertii, of which over one-third would presumably have been spent maintaining the Roman army. The other major expense was the extensive reconstruction of Rome. At the time of Domitian's accession the city was still suffering from the damage caused by the Great Fire of 64, the civil war of 69 and the fire in 79. The conquest of Britain continued under the command of Gnaeus Julius Agricola, who expanded the Roman Empire as far as Caledonia, or modern day Scotland. Domitian also founded a new legion in 82, the Legio I Minervia, to fight against the Chatti. Domitian is also credited on the easternmost evidence of Roman presence, the rock inscription near Boyukdash mountain, in present-day Azerbaijan. As judged by the carved titles of Caesar, Augustus and Germanicus, the related march took place between 84 and 96 AD. The victory proved short-lived, however: as early in 86 Fuscus embarked on an ill-fated expedition into Dacia, which resulted in the complete destruction of the fifth legion, Legio V Alaudae, in the First Battle of Tapae. Fuscus was killed, and the battle standard of the Praetorian Guard was lost. The loss of the battle standard, or aquila, was indicative of a crushing defeat and a serious affront to Roman national pride. Domitian also revived the practice of the imperial cult, which had fallen somewhat out of use under Vespasian. Significantly, his first act as an Emperor was the deification of his brother Titus. Upon their deaths, his infant son, and niece, Julia Flavia, were likewise enrolled among the gods. With regards to the emperor himself as a religious figure, both Suetonius and Cassius Dio allege that Domitian officially gave himself the title of Dominus et Deus. However, not only did he reject the title of Dominus during his reign, but since he issued no official documentation or coinage to this effect, historians such as Brian Jones contend that such phrases were addressed to Domitian by flatterers who wished to earn favors from the emperor. 4th century writings by Eusebius of Caesarea maintain that Jews and Christians were heavily persecuted toward the end of Domitian's reign. The Book of Revelation is thought by some to have been written during this period. Although Jews were heavily taxed, no contemporary authors mention trials or executions based on religious offenses other than those within the Roman religion. Both Tacitus and Suetonius speak of escalating persecutions toward the end of Domitian's reign, identifying a point of sharp increase around 93, or sometime after the failed revolt of Saturninus in 89. At least twenty senatorial opponents were executed, including Domitia Longina's former husband Lucius Aelius Lamia and three of Domitian's own family members, Titus Flavius Sabinus, Titus Flavius Clemens and Marcus Arrecinus Clemens. Some of these men were executed as early as 83 or 85 however, lending little credit to Tacitus' notion of a "reign of terror" late in Domitian's reign. According to Suetonius, some were convicted for corruption or treason, others on trivial charges, which Domitian justified through his suspicion: "He used to say that the lot of Emperors was most unfortunate, since when they discovered a conspiracy, no one believed them unless they had been murdered." Jones compares the executions of Domitian to those under Emperor Claudius (41–55), noting that Claudius executed around 35 senators and 300 equestrians, and yet was still deified by the Senate and regarded as one of the good Emperors of history. Domitian was apparently unable to gain support among the aristocracy, despite attempts to appease hostile factions with consular appointments. His autocratic style of government accentuated the Senate's loss of power, while his policy of treating patricians and even family members as equals to all Romans earned him their contempt. Domitian was assassinated on 18 September 96, in a palace conspiracy organized by court officials. A highly detailed account of the plot and the assassination is provided by Suetonius, who alleges that Domitian's chamberlain Parthenius was the chief instigator behind the conspiracy, citing the recent execution of Domitian's secretary Epaphroditus as the primary motive. The murder itself was carried out by a freedman of Parthenius named Maximus, and a steward of Domitian's niece Flavia Domitilla, named Stephanus. The precise involvement of the Praetorian Guard is less clear. At the time the Guard was commanded by Domitian's relative Titus Flavius Norbanus, former governor of the province of Raetia, and Titus Petronius Secundus and the latter was almost certainly aware of the plot. Cassius Dio, writing nearly a hundred years after the assassination, includes Domitia Longina among the conspirators, but in light of her attested devotion to Domitian—even years after her husband had died—her involvement in the plot seems highly unlikely. Dio further suggests that the assassination was improvised, while Suetonius implies a well-organized conspiracy. For some days before the attack took place, Stephanus feigned an injury so as to be able to conceal a dagger beneath his bandages. On the day of the assassination the doors to the servants' quarters were locked while Domitian's personal weapon of last resort, a sword he concealed beneath his pillow, had been removed in advance. In accordance with an astrological prediction the Emperor believed that he would die around noon, and was therefore restless during this time of the day. On his last day, Domitian was feeling disturbed and asked a servant several times what time it was. The boy, included in the plot, lied, saying that it was much later than noon. More at ease, the Emperor went to his desk to sign some decrees, where, according to Suetonius, he was suddenly approached by Stephanus: "Then pretending to betray a conspiracy and for that reason being given an audience, [Stephanus] stabbed the emperor in the groin as he was reading a paper which the assassin handed him, and stood in a state of amazement. As the wounded prince attempted to resist, he was slain with seven wounds by Clodianus, a subaltern, Maximus, a freedman of Parthenius, Satur, decurion of the chamberlains, and a gladiator from the imperial school." Domitian and Stephanus wrestled on the ground for some time, until the Emperor was finally overpowered and fatally stabbed by the conspirators; Stephanus was stabbed by Domitian during the struggle and died shortly afterward. Around noon Domitian, just one month short of his 45th birthday, was dead. His body was carried away on a common bier, and unceremoniously cremated by his nurse Phyllis, who later mingled the ashes with those of his niece Julia, at the Flavian temple. According to Suetonius, a number of omens had foretold Domitian's death. Several days prior to the assassination, Minerva had appeared to him in a dream, announcing she had been disarmed by Jupiter and would no longer be able to protect him. The most extensive account of the life of Domitian to survive was written by the historian Suetonius, who was born during the reign of Vespasian, and published his works under Emperor Hadrian (117–138). His De Vita Caesarum is the source of much of what is known of Domitian. Although his text is predominantly negative, it neither exclusively condemns nor praises Domitian, and asserts that his rule started well, but gradually declined into terror. The biography is problematic however, in that it appears to contradict itself with regards to Domitian's rule and personality, at the same time presenting him as a conscientious, moderate man, and as a decadent libertine. Hostile views of Domitian were propagated until well into the early 20th century, before archeological and numismatic advances brought renewed attention to his reign, and necessitated a revision of the literary tradition established by Tacitus and Pliny. In 1930, Ronald Syme argued a complete reassessment of Domitian's financial policy, which had until then been largely viewed as a disaster, opening his paper with the following introduction: "The work of the spade and the use of common sense have done much to mitigate the influence of Tacitus and Pliny and redeem the memory of Domitian from infamy or oblivion. But much remains to be done." Over the course of the 20th century, Domitian's military, administrative and economic policies were re-evaluated. New book length studies were not published until the 1990s however, nearly a hundred years after Stéphane Gsell's Essai sur le règne de l'empereur Domitien (1894). The most important of these was The Emperor Domitian, by Brian W. Jones. In his monograph, Jones concludes that Domitian was a ruthless, but efficient autocrat. For the majority of his reign, there was no widespread dissatisfaction with the emperor or his rule. His harshness was felt by only a small, but highly vocal minority, who later exaggerated his despotism in favour of the well-regarded Nervan-Antonian dynasty that followed. Domitian's foreign policy was realistic, rejecting expansionist warfare and negotiating peace at a time when Roman military tradition dictated aggressive conquest. His economic program, which was rigorously efficient, maintained the Roman currency at a standard it would never again achieve. Persecution of religious minorities, such as Jews and Christians, was non-existent. Domitian's government nonetheless exhibited totalitarian characteristics. As Emperor, he saw himself as the new Augustus, an enlightened despot destined to guide the Roman Empire into a new era of Flavian renaissance. Religious, military and cultural propaganda fostered a cult of personality. He deified three of his family members and erected massive structures to commemorate the Flavian achievements. Elaborate triumphs were celebrated in order to boost his image as a warrior-emperor, but many of these were either unearned or premature. By nominating himself perpetual censor, he sought to control public and private morals. Although contemporary historians vilified Domitian after his death, his administration provided the foundation for the Principate of the peaceful 2nd century. His successors Nerva and Trajan were less restrictive, but in reality their policies differed little from Domitian's. Much more than a "gloomy coda to the...1st century" the Roman Empire prospered between 81 and 96, in a reign that Theodor Mommsen described as the sombre but intelligent despotism of Domitian.